Hookedblog finally managed to get over to Commercial Street early enough to photograph this impressive piece painted recently by UK artist Shok 1. This 'Heart Noose' piece has been painted on the exterior shutters of Pictures On Walls Gallery and was to tie-in with a series of prints the artist released last week with Pictures On Walls. No surprise that all the colourways of this great image have now sold out. We here are loving the placement on this piece and how Shok 1 has wrapped the noose around the window arch. This is not the first time that Shok 1 has painted this image, we last saw of version of the Heart Noose back in July of last year when the artist painted a version of it for the Shanghai Expo in Shenzhen. 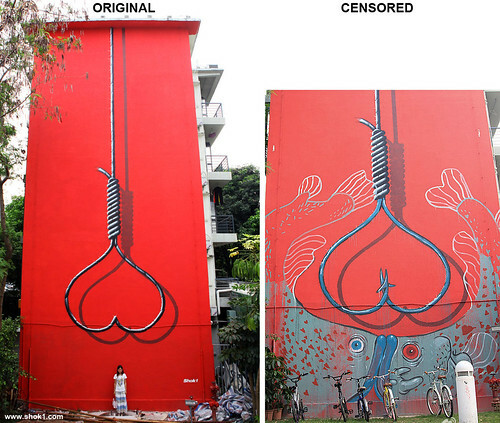 The piece was later censored/altered by the Chinese Government, you see the before and after images below. 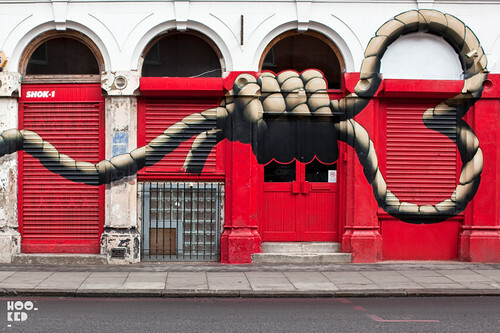 To see more of Shok 1's work visit his website or for more upto date work check the artist Flickr site. SHOK1 has just posted this short clip of the London Heart Noose piece being painted outside Pictures On Walls, have a look and if you are in London go check the piece in person, it's on Commercial Street.